I found an Asian sesame ginger salad dressing by Ken's Steakhouse in the grocery store the other day that sounded pretty good - unfortunately it contained high fructose corn syrup and since I'm cutting that out of our diets, I decided to leave it at the store. 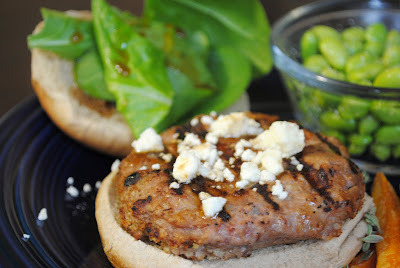 But it was still in the back of my mind when I decided to make these turkey burgers for dinner. I'm not positive this is the exact same result but it turned out to be really good. I served these with some sweet potato fries with salt and thyme and steamed edamame sprinkled with a little garlic salt for an easy, healthy meal. Preheat grill on medium low heat. In a large bowl, whisk together oil, vinegar, and soy sauce. Add garlic, ginger, and black pepper and stir to combine. Remove about 1/3 of the mixture and set aside. Add ground turkey and bread crumbs and lightly mix with your hands until just incorporated, be careful not to over mix. Form into 4 patties and transfer to grill. Cook about 5-6 minutes and flip, grill an additional 5 minutes until cooked through. Grill buns for last minute of cooking time to warm. To assemble, either top each burger with spinach and feta and drizzle on remaining sauce or combine spinach, feta and dressing in a bowl and toss to coat. Top each burger with "salad" and serve. These look really yummy. 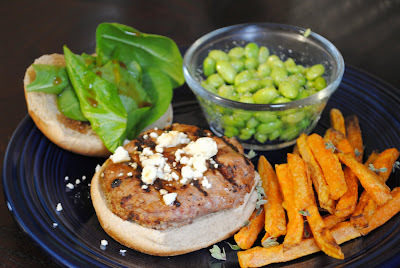 And are those sweet potato fries and edamame? I love the idea of both of those as sides! Thank you - they are but I have to admit the sweet potato fries were frozen... sometimes it's just easier that way. 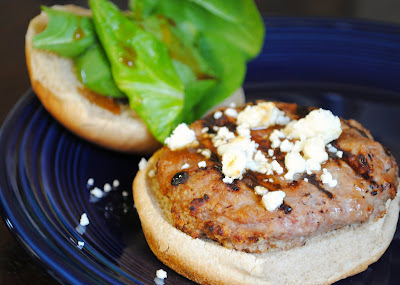 Looking around for turkey burgers the other day, I made these. They worked really, really well with grilled pineapple slices on top. The soy and ginger flavors blended perfectly with the tart, sweet pineapple. Thanks!